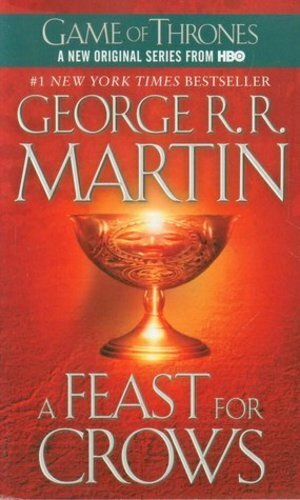 I found that A Feast for Crows was my least favorite thus far in the Game of Thrones books. Still exceptional writing, but the story was a bit drab. Full review as originally posted on The Book Addict's Guide: While A FEAST FOR CROWS wasn't my favorite of the series so far, it was definitely still enjoyable. It's hard to review because like all of the other books, SO much happens throughout the course of 1000+ pages, but as always, I will do my best! So we follow more minor characters in A FEAST FOR CROWS, but the lack of power players is made up with scenery changes. We get to explore places like Dorne, Oldtown, and other places outside of Westeros. I think this book really adds a deeper layer to the series, seeing more places, adding more history, and really weaving everything together. There were definitely less "OMG" moments seeing as the major plot points are typically following the stronger characters, but we eventually work up to some pretty awesome twists and surprises at the end of the book. AFFC is definitely a slower pace, especially after coming down of the highs and sudden drops in A STORM OF SWORDS, but we receive a lot of important information in this book. I can also say that having already started A DANCE WITH DRAGONS, I'm already seeing these story lines looping back into the main plot and why they were important to see standing on their own. I really struggled with some of the Greyjoy chapters (Greyjoys. They're the new Davos.) but I think that was partially because I just really didn't know that much about them aside from meeting Theon and briefly Asha. It's always hard to start chapters with new characters whose histories I'm not familiar with yet. Those chapters also take place in the Iron Islands which is a territory I'm also not familiar with so it just becomes to be too much of an unknown and I get swamped in all of the details. They do have an interesting history and what seems to be an important part of the series, but those were my one big struggle in A FEAST FOR CROWS. I actually didn't know that this was a sort of "Part One" type of book before I started so I was really missing people like Dany, Jon, and Tyrion when I first started. I definitely think it's important to know that it's more like a piece of the bigger picture before starting! The last couple chapters were incredibly interesting and we finally have some "OMG" moments that the rest of the book seemed to be lacking. I'm glad it had an epic ending because it really made me more excited to start A DANCE WITH DRAGONS and the final push of our Song of Ice and Fire read along!